Please inquire about quantity orders, international shipping and custom boxes! In Stock as of June 2018.Please inquire about availability before placing an order online! To see more detailed images, click on the picture to the left. 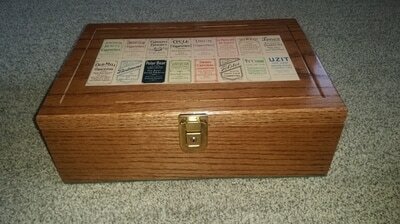 Box is designed to hold about 300 'graded' cards. Picture shows 67 'PSA' graded cards in thin protective sleeves in one row. Holds about 77 'PSA' graded cards without the sleeves. 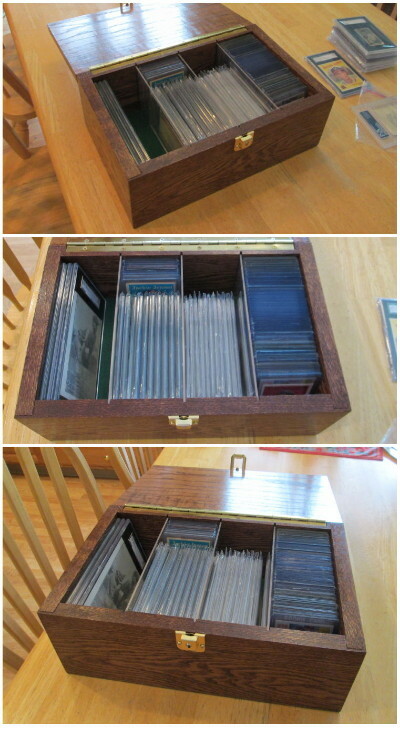 Also holds 'SGC' and 'BGS' graded cards. Custom made from stained 1/2" oak plywood. Felt interior and bottom. 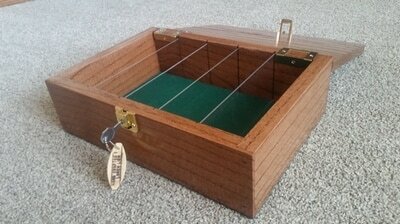 Clear removable dividers. Brass side handles and strong hinges. Lockable from latch (lock not included). 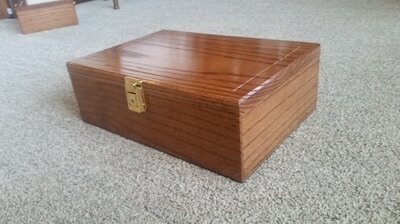 Box measures 16" x 15 3/8" and 7" tall. These are outside dimensions. Top of the box has a wood cutout of a player swinging a bat (not a decal or sticker). 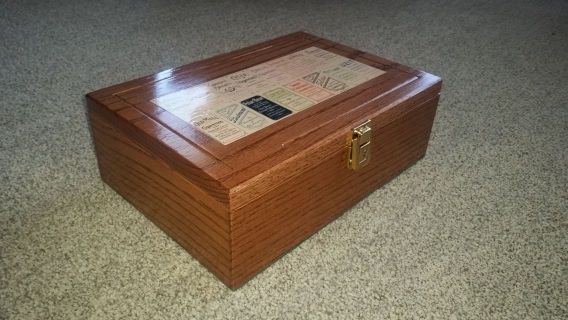 Gives the box a unique or custom look. T-206 Tobacco card box - more information. To see more detailed images, click on the picture to the left. 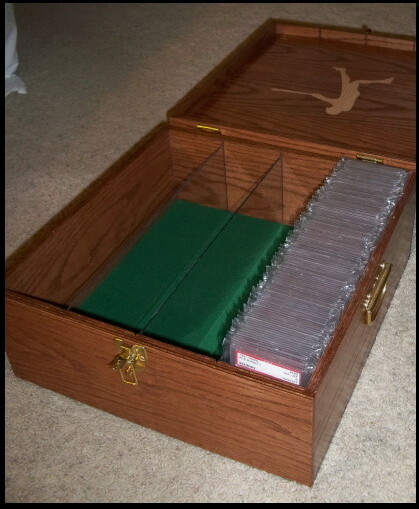 Box is shown with 525 "Ultra Pro" tobacco card top-loader holders. Each holder measures about: 2-1/8 X 3-1/8". Note: Other brand holders may not be exactly the same size. Many are fatter, so not as many can fit inside the box. 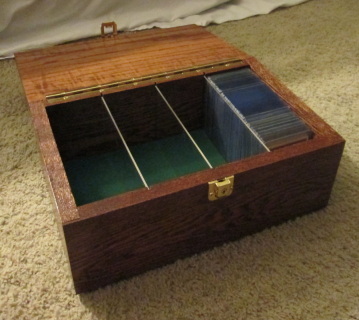 Dividers can be removed to accommodate larger cards or items, and graded card holders. 40 'SGC' or 52 'PSA' brand holders comfortably fit inside. Dividers are clear Plexiglas. Green felt inside and on the bottom. The T206 card set is one of the most popular sets of all time. Cards were issued from 1909 to 1911 and distributed in cigarette packs. Set contains about 524 cards when complete. Please click on the image for more detailed images. New lock design - see images below. Designed to hold about 420 Ultra Pro standard 3x4 top loaders. Made from solid oak with rich walnut stain. Removable clear dividers. Felt bottom. 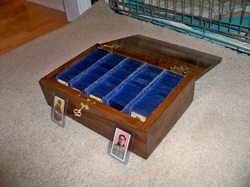 Can also hold about 40 'graded' cards - either on their back or on their side. Can hold about 40 SGC 'tall-boy' holders on their sides too. Strong hinge. Key lock. Size is about 14" wide, 9.25" wide and 5.75" tall. Can store holders up to 4 3/8" inside. $140+ $40 S/H.